Valvular heart disease affects millions of patients in the United States–many of which have severe disease associated with decreased survival. The GCRG has had a long-standing interest in understanding the normal and pathologic processes that contributed to valve function or dysfunction, respectively. With particular attention towards ischemic mitral regurgitation, we utilize a multi-modality approach to define the biomechanical factors that influence disease progression post-infarct. Following the advent of 3D echocardiography and sonomicrometry array localization, our group first described distortions of the normal saddle-shaped mitral annulus following ischemic insult (3rd Gorman et al. 1997; Gorman et al. 1995). Using finite element modelling , we have since been able to describe in great detail the leaflet stress distribution in both normal and pathologic conditions. 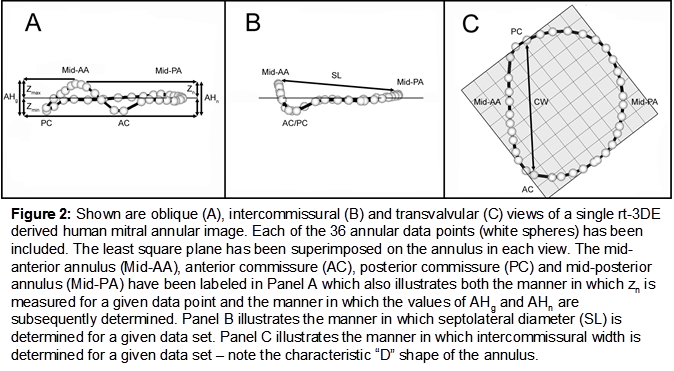 Of particular importance, our work has shown a biomechanical advantage to maintaining leaflet curvature and annular saddle shape (Annular Height to Commisural Width Ratio – AHCWR – ~15%) by reducing peak leaflet stress (Salgo et al. , 2002). Before our work the pathogenesis of IMR was an enigma. IMR was well known as an ominous disease caused by myocardial infarction effecting 100,000s of patients. But its insidious nature generated confusion and a very poor understanding of the disease mechanism. As a result surgical strategy was haphazard and inconsistent. Using an ovine model of the disease, sonomicrometry and novel 3D echocardiographic imaging analysis (all developed by our group) we demonstrated that post-infarction ventricular remolding created relatively subtle distortions in annular geometry as well as distortions in the papillary muscle- annular dynamics. We were able to quantify these distortions and dysfunction with a high degree of refinement. As our 3D echo imaging capabilities increase over the ensuing 20 years we were able to translate our animal finding directly to the human disease. These finding have refined the surgical strategies for IMR regarding both patient selection and operative techniques. Ring annuloplasty is a key component of mitral valve repair. The goal of annuloplasty is to restore annular geometry and reduce stress. Since Levine’s work with 3D echocardiography in the 1980’s it was known that the annulus had a distinctive saddle shape. The application of this finding to the design of annuloplasty rings went unrecognized until our 2002 theoretical work which demonstrated that annular saddle shape promoted leaflet curvature and reduced leaflet stress. Since most mitral valve repair failures were the result of leaflet stress we predicted that saddle ring annuloplasty would reduce stress when compared to standard flat annuloplasty and increase repair durability. During the past decade we have developed novel 3D echocardiographic imaging techniques which have allowed us to expand our understanding of the mitral annulus. We have used this information to design two generations of saddle shaped annuloplasty rings (St. Jude Saddle Ring, Medtronic Profile 3D). Both these devices our in wide clinical use and have had a significant impact on mitral repair strategies. In more recent work we have used our 3D echocardiographic imaging techniques to demonstrate that saddle ring annuloplasty does in fact increase leaflet curvature and reduce stress on the repair. We have also shown in both human and animal studies that saddle annuloplasty increases leaflet coaptation in both IMR and myxomatous cases. It has been extremely satisfying to see the clinical impact of this work. These findings have changed the way mitral valve repair is carried out and studied. 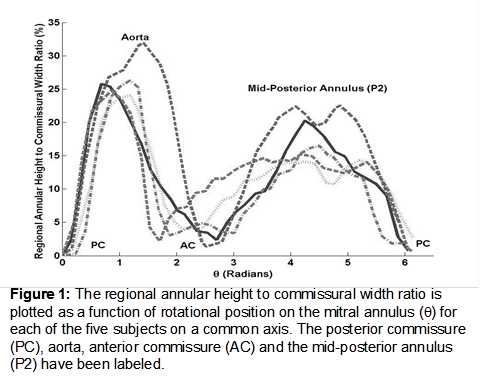 Prior to our 2002 publication there was very little if any work published in the literature on the saddle shape of the mitral annulus. Since 2002 there have been 246 publications dealing with the saddle shape mitral annulus, 166 dealing with saddle shaped annuloplasty and the initial 2002 paper has been referenced over 250 times. Quantitative Real-Time 3D Echocardiography and its Influence on Mitral Valve Therapy. The advent of 3D echocardiography was met with great enthusiasm for its potential application to the study of the mitral valve and the development of mitral valve repair procedures. Despite this early optimism clinical adaptation was slow due to the inability to extract quantitative data from the images. During the past decade our group has worked steadily to develop complex analysis algorithms and to increase the speed with which these algorithms can be applied to extract quantifiable information for 3D echocardiographic imaging. 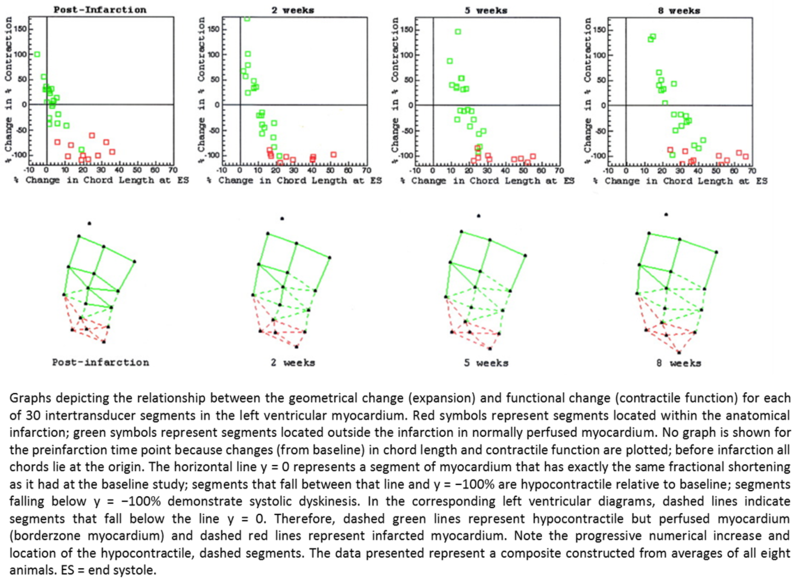 These algorithms can now be used to quantitatively assess both annular and leaflet geometry in near real time. The initial algorithms were limited in their use due to the labor intensive methods required to create the images. During the past several years we have made advances that have almost completely automated the process to allow the regional aspects of annular height, leaflet curvature, leaflet coaptation, leaflet tethering to be assessed throughout the cardiac cycle. These advances have had a great impact on the planning, surgical optimization and postoperative surveillance of mitral valve repair techniques. They have also had a profound influence on mitral ring annuloplasty design. The imaging data from these techniques has also facilitated increasingly more complex and accurate computer modeling of the mitral valve and left ventricle. These models will open the door to even more improvements in mitral valve repair and replacement devices including transcatheter mitral valve replacements designs. A comprehensive visual and quantitative analysis of in vivo human mitral valve morphology is central to the diagnosis and surgical treatment of mitral valve disease. Real-time 3D transesophageal echocardiography (3D TEE) is a practical, highly informative imaging modality for examining the mitral valve in a clinical setting. To facilitate 3D TEE image analysis without the need for user interaction, we have developed a fully automated method for segmenting the mitral leaflets in 3D TEE image data. The algorithm integrates complementary probabilistic segmentation and shape modeling techniques to automatically generate 3D patient-specific models of the mitral leaflets from 3D TEE image data. The method accurately captures patient-specific leaflet geometry at both systole and diastole in 3D TEE data acquired from a mixed population of subjects with normal valve morphology and mitral valve disease. Automatic segmentation of the mitral leaflets at diastole (top row) and systole (bottom row) for a given patient. First, a probabilistic segmentation is generated by multi-atlas label fusion (red = anterior leaflet, blue = posterior leaflet). Then a valve template (translucent) is initialized to the multi-atlas segmentation, and the template is deformed to obtain a model of the mitral leaflets. The fitted diastolic model is used to initialize model fitting of the same subject’s valve at systole. Echocardiography is the most commonly used imaging modality for evaluation of heart valve disease. Image segmentation in 3D echocardiographic (3DE) data is a means of extracting visual and quantitative information about patient-specific valve morphology that can support valve diagnostics and surgical planning. Image segmentation in this context, however, can be difficult due to the signal dropouts and noise that are characteristic of 3DE imaging, as well as the fact that many valve landmarks are defined anatomically rather than by distinctive image intensity characteristics. To overcome this challenge, we have developed a method that extends our image analysis techniques for mitral valve segmentation to accommodate segmentation of the aortic valve in 3DE images. The method captures the complete aortic valve apparatus, from the left ventricular outlet to the sinotubular junction, including the three aortic cusps. 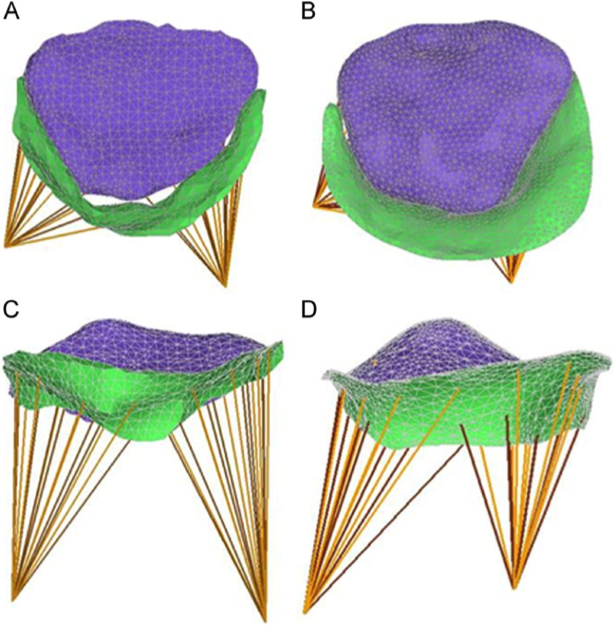 Segmentation of the complete aortic valve apparatus (cusps and root) using a deformable branching medial model. The basis of mitral annuloplasty ring design has progressed from qualitative surgical intuition to experimental and theoretical analysis of annular geometry with quantitative imaging techniques. To support advancement in annuloplasty ring design, we leverage automated 3D echocardiographic image analysis to statistically assess variability in normal mitral annular geometry. First, 3D patient-specific models of the mitral annulus are automatically generated from 3D echocardiographic images acquired from subjects with normal mitral valve structure and function. 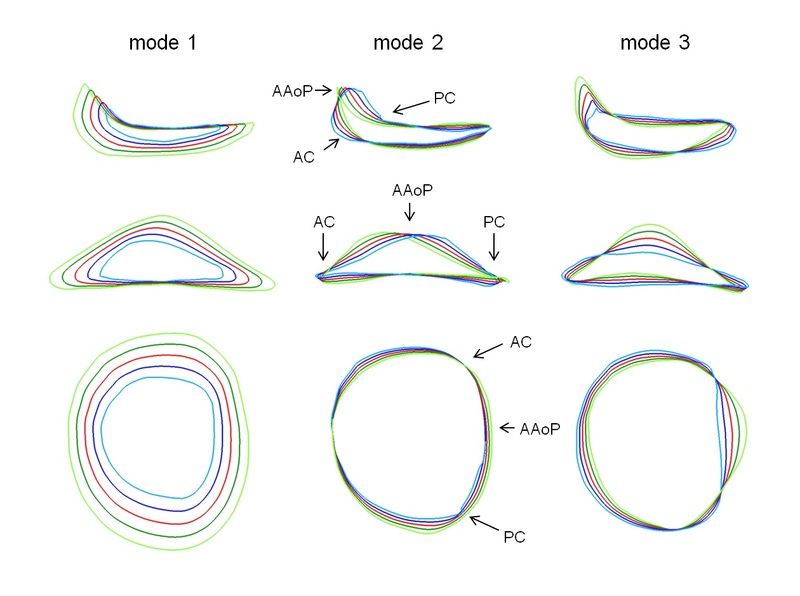 A mean 3D annular contour is then computed, and principal component analysis is used to assess the primary modes of shape variation in the normal mitral annulus. 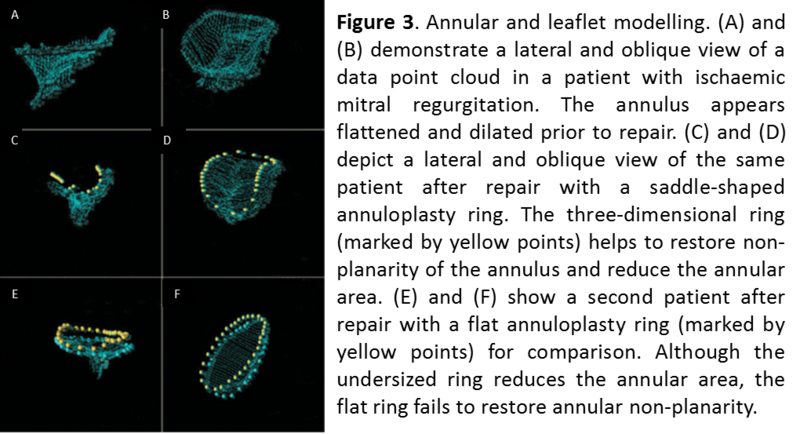 Three modes of variation in normal annular geometry (columns), shown from three different viewpoints (rows). The red curve is the mean annular shape, the dark and light blue curves are ±1 and ±2 standard deviations from the mean, and the dark and light green curves are ±1 and ±2 standard deviations from the mean along a given mode of shape variation obtained by principal component analysis. In conjunction with clinical expertise, the ability to assess leaflet and chordal stresses in repaired valves will likely lead to improved surgical results by identifying patients with high stress valves in the early post-operative period. Such patients could either have re-repair or valve replacement before ever leaving the operating room, or could be subjected to closer post-operative clinical follow-up. Towards this goal, we have developed an integrated methodology for imaging, segmenting, modeling, and predicting pressure-derived mitral leaflet stresses. In vivo human mitral valves are imaged using real-time 3D transesophageal echocardiography, and patient-specific valve models generated by automated image analysis techniques are loaded with physiologic pressures using finite element analysis. Regional leaflet stress distributions are predicted in normal and diseased (regurgitant) mitral valves. Finite element models of mid systolic diseased (A, C) and normal (B, D) mitral valves reconstructed from 3D transesophageal echocardiographic images, in transvalvular (A, B) and oblique (C,D) views. Von Mises stress contour maps of diseased (left) and normal (right) mitral valves. Transcatheter mitral valve replacement (TMVR) represents an exciting new frontier in cardiac device technology development with the potential to revolutionize the management of heart failure in older, high-risk patients with inoperable mitral regurgitation. The potential impact of this technology cannot be over stated. Over the past eight years our group has applied our knowledge of mitral valve anatomy, understanding of mitral valve pathology, cardiovascular imaging and prototyping capabilities to developed a novel atraumatic sutureless anchoring and sealing technology that is extremely flexible which facilitates TMVR. We have also developed and associated delivery system which allows the device to be delivered via both the trans atrial approach and the trans ventricular approach. We are currently working on the latest iteration of the device which will ultimately see its first use in humans early 2017. Chronic heart failure after an acute myocardial infarction effects millions of patients worldwide. Prior to our work it was known that early infarct expansion predicted late generalized ventricular dilatation and progressive loss of ventricular function but the mechanism of the progression was unknown. It was thought that the ischemic syndromes of myocardial stunning and hibernating myocardium were responsible for post infarction heart failure progression. However our group, using animal models, sonomicrometry imaging, 3D echocardiography, MRI and finite element stress analysis demonstrated a third type of myocardium – remodeled myocardium. We demonstrated that early infarct stretching produced geometrical changes in normally perfused adjacent boarderzone myocardium which increased wall stress and decreased function in this region This stress induced myopathic process was shown to progressively involve more and more myocardium ultimately resulting in heart failure. Subsequent work demonstrated that mechanical strategies to prevent the initial infarct stretching by stiffening the infarct could prevent progression of post infarction remodeling and heart failure. This work has been the basis for several patents and start-up companies created to bring these treatment strategies to clinical applications. While there are well known echocardiographic insights into the 3D morphology of mitral valves with ischemic mitral regurgitation, such as annular dilation and leaflet tethering, less is understood about how quantification of valve dynamics can inform surgical treatment of IMR or predict short-term recurrence of the disease. As a step towards filling this knowledge gap, we have created a novel framework for 4D segmentation and geometric modeling of the mitral valve in real-time 3D echocardiography (rt-3DE). The framework integrates multi-atlas label fusion and template-based medial modeling to generate quantitatively descriptive models of valve dynamics. The novelty of this work is that temporal consistency in the rt-3DE segmentations is enforced during both the segmentation and modeling stages with the use of groupwise label fusion and Kalman filtering. (a) Manual segmentation and (b) model fitting to the GW-MALF results for a subject with normal mitral valve function. The anterior leaflet is red, posterior leaflet green. Comparison of bending angle, septolateral diameter (SLD), and intercommissural width (ICW) in subjects with normal mitral valves (red) and severe IMR (blue) over one cardiac cycle. The error bars represent one standard deviation from the mean.